You are here: Home » GENRE » Science » World’s largest single-piece 3-D printed rocket engine? Welcome to Spaceport Scotland! 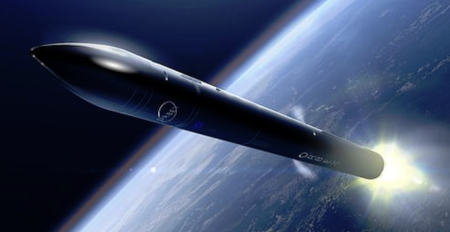 Scottish rocket-ship manufacturer Orbex has just unveiled its Prime rocket – designed to deliver micro-satellites into orbit – for the first time. The completed engineering prototype of the Stage 2 rocket (the stage that will transit into orbital flight after launch) is made from a lightweight carbon fibre and aluminium composite and includes the world’s largest 3-D printed rocket engine. Orbex Prime is a completely re-thought two-stage rocket, designed by their engineers (with previous track-records at organisations including NASA, ESA and Ariane). Due to its revolutionary architecture, Prime launchers are up to 30% lighter and 20% more efficient than other vehicles, packing more power per cubic litre than many heavy launchers. Their 3-D printed rocket engine was uniquely manufactured in a single piece without joins. Given the extreme temperature and pressure fluctuations involved in space flight, this gives the engine an advantage over other rocket engines, which can suffer from weaknesses associated with joining and welding. It is also the first commercial rocket engine designed to work with bio-propane, a clean-burning, renewable fuel source that cuts carbon emissions by 90% compared to fossil hydrocarbon fuels. Orbex first came into the public eye in July of 2018, when the UK Space Agency announced that Orbex had been chosen to launch from a spaceport in Sutherland in the Scottish Highlands, as part of the main consortium. On Orbex Prime’s maiden flight from Scotland in 2021, the rocket will carry an experimental payload from UK-based Surrey Satellite Technology Ltd. (SSTL), the world’s leading manufacturer of small satellites. This launch will represent an important first for the UK commercial space industry, demonstrating the UK’s end-to-end launch capability with a UK rocket launching a UK satellite from a UK spaceport. Orbex also announced that Swiss-based Astrocast SA, has selected Orbex to launch multiple nanosatellites for the development of a planet-wide Internet of Things network. Astrocast’s satellite-based IoT network will eventually include 64 nanosatellites, spread across eight strata above the Earth to deliver IoT connectivity across the planet, including regions currently considered remote or inaccessible. « Child’s Play (2019): horror film trailer.